US President-elect Donald Trump, who will officially take office on January 20, held his first press conference since winning the presidency on Wednesday local time. In about an hour, the most questions raised were regarding reports of Russia having compromising information on Trump. He also spent some time responding to how he will handle ties between his business and his presidency. Trump insisted on building a wall on US border with Mexico and the latter is going to pay for it. He also reiterated the future abolishment of Obamacare and will replace it with a new medical reform plan. Trump mentioned China six times on four issues, including describing Jack Ma of Alibaba as an incredible person and that they are going to do tremendous things together. He said the US is losing hundreds of billions of dollars every year due to trade imbalance with China, Japan, Mexico and other countries. On the issue of Russia hacking the 2016 election, he noted his nation gets hacked by other countries as well, including China, which resulted in the loss of personal information of 22 million employees who work for the US government. He said that "Russia and other countries — and other countries, including China, which has taken total advantage of us economically, totally advantage of us in the South China Sea by building their massive fortress, total. Russia, China, Japan, Mexico, all countries will respect us far more, far more than they do under past administrations." During the conference, which attracted widespread attention, Trump did not mention the Taiwan question, nor did he articulate how he will handle Sino-US ties. Relevant questions were not raised by reporters either. It looks like that US mainstream public opinion still finds it hard to accept the fact that Trump has been elected as their new president. They are suspicious about and alert to Trump's friendly attitude toward Russia, his family businesses and how he would transform Obama's medical policy. US media outlets are particularly eager to hype Trump's relations with Russia and the Kremlin's alleged influence on the election. It seems they are, intentionally or unintentionally, restricting Washington's ability to improve ties with Moscow under Trump. Trump will face a number of thorny issues after taking office, some of which are left by Obama, and some are a result of his provocation to the norms. The Obama government has attached different levels of importance to issues of domestic affairs, Latin America problem, US ties with allies, the Middle East chaos, anti-terrorism operations and the need to counter Russia and China. Obama's considerations cannot be overlooked. Trump will have less room for his personal initiative in the White House than in his Twitter "kingdom." Shortly after his presidential victory, Trump poked the one-China policy - a move to stir up a hornets' nest. Actually, the White House has too many burning issues in front of it to put out. But Trump perversely stirred up the Taiwan question and stunned many Americans. 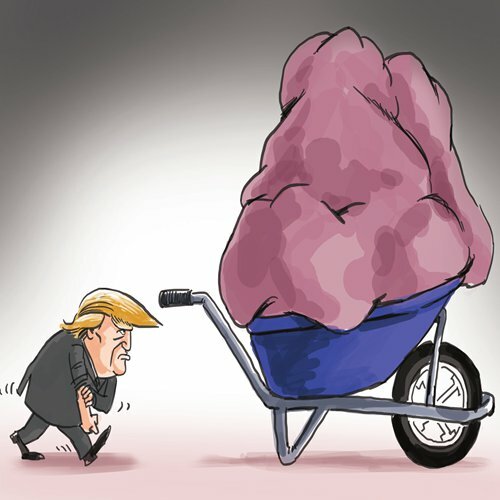 In the past two months, Trump has indulged himself in the triumph and acted like a political opponent when he sneered at the Obama administration. But after he is sworn in, he will be responsible for every US issue and facing the scorching public opinion. As Trump's Twitter account has become a super media in the world, the US mainstream media would not stop taming his rhetoric. Trump is expected to be more cautious after he takes office where he will review all affairs, especially the US diplomacy that requires second thoughts. Trump's first news conference after his presidential victory has shown that he will have huge challenges when he settles into the White House. He will be difficult to be an unrestrained president, on the contrary, the media will distract him regularly, affecting his resolve and actions.